This treatment is perfect for those looking for a quick procedure to rejuvenate and revitalize the skin. Laser skin rejuvenation has become the procedure of choice among top celebrities and working population who cannot afford time away from work to recover from more intense procedures, or who want a better solution to sun-damaged, aging or acne-scarred skin. 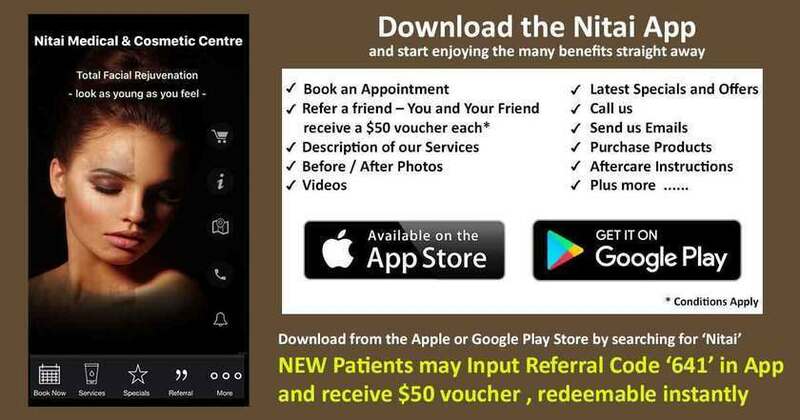 Our doctor at Nitai specialises in the treatment of laser tattoo removal in Melbourne using a very sophisticated state-of-the-art medical grade laser machine called the “Revlite”. The advent of Q-Switched lasers has permitted that Tattoo removing has a low risk of scarring under a trained and experienced professional. The Revlite Q-Switched Nd:YAG laser is the laser of choice in this class of laser. The use of the Revlite for Tattoo Removal can significantly lighten or remove a wide variety of tattoo inks with a very low risk of scarring. The Revlite is the most advanced laser available on the Global market currently for Tattoo Removal. This latest laser technology treats tattoos of all colours and all skin types. Given this amazing technology, our pricing strategy initially setup for the North and West regions for Melbourne is unmatched and ensures you will receive the highest quality service at the lowest prices. We regularly have clients from all parts of Victoria because the cost savings combined with the high quality service by a trained doctor far outweigh the travel costs. We are located only 15 minutes from Melbourne CBD. As we are also an accredited medical centre voted in Australia’s top 100 Medical centres, all our quality disciplines ensure you will be treated with the highest standard. Our doctor uses local anaesthetic for pain management ensuring your comfort during the procedure. How Does the Revlite Laser Effective in Tattoo Removal? The Revlite laser removes tattoo ink with the energy of light. A laser is a device which is designed to produce one or more specific wavelengths of light. Tattoo ink is removed by using this specific wavelength of light which passes into the skin, but is absorbed by the ink. The rapid absorption of light energy causes the tattoo ink to break into tiny particles which can then be removed by the body’s natural filtering systems. The Revlite laser provides maximum laser tattoo removal while leaving the surrounding skin unharmed. The Revlite laser can remove Professional, amateur(homemade), traumatic and surgical tattoos. Dark (blue , black) and red inks will resolve the best. Orange and purples usually fade as well. Green and yellow inks are the most difficult to remove , and additional treatments are needed to produce significant fading. In many cases, yes. Greater than 95% fading of the tattoo may be accomplished. However, it is important to know that there are many, many types of tattoo inks in use worldwide today, none of which is regulated. Not knowing which tattoo ink was used, or how deeply it was applied, makes it impossible for the physician to predict the degree of removal on any given tattoo. The Revlite laser emits light in very short pulses. The impact of the energy from the powerful pulse of light is similar to the snap of a small rubber band on the skin. The majority of patients do not require anesthesia, depending on the size and location of the tattoo. Anesthesia creams are available if needed. An antibacterial ointment and a dressing will be applied to the area immediately after the treatment. Occasionally, there will be pinpoint bleeding associated with the treatment. The treated area should be kept clean. Follow your doctor’s instructions exactly as to what to do during the days following the procedure. A shower can be taken the next day, although the treated area should never be scrubbed. If a scab forms it is vital that you do not pick it or scratch it. Laser Tattoo Removal prices range from $50 – $800 and are charged per session. The actual cost for an individual will depend on the area of the tattoo in square centimetres. The number of sessions required cannot be predicted in advance. To get an accurate cost assessment we offer Free consultations. There is no obligation to get treatment. However, if you so wish, generally we can accommodate treatment in the same visit. We do NOT apply a loading fee for additional colours. This is a significant saving to you.